Django vs Laravel: Which Framework Should You Choose? We’ve all made sandwiches using bread at some point of time in life. Frameworks in web development are like the bread, they are the base on which sandwiches, here web applications, web services and software are (spread) built. Just like you have umpteen options in making a sandwich regarding choice of bread, fillings used,flavors and so on, you have a number of options when it comes to web app development frameworks — including, using the right framework, the language, the libraries, extensions and so on. In this article, we will be discussing two of the major web development frameworks developers use today — Django and Laravel, and look at a fair comparison of the two. But first, we need to execute the pleasantries by introducing the two frameworks. A framework dispenses with the need of reinventing the wheel. It is a ‘skeleton’ on which the designers and developers build unique applications with desired features. You can also call it as an abstract tool that would help you develop applications and reuse code. It will contain the common codes, a pre-template structure, but not a user interface. However, frameworks like Django do provide an administration interface. But for many of the others, the developers will have to write the code, and use it to interact with the different parts of the framework. The right framework for your project will help you code faster and easier. It can greatly impact the development process and help you finish your project within client timelines. The main purpose of web development frameworks is to make the entire process simple and save the developers precious time by making arduous and repetitive tasks easier. There are plenty of frameworks available in the market, each of them delivering high performance in one scenario or the other. Most backend applications including web services, web applications, and software are developed using these frameworks. However, to make categorizing these frameworks easier, we can say that they come in two types. 1. Software Frameworks — Software frameworks are part of a larger software framework, wherein the common code that provides generic functionality can be selected and overwritten to provide specific functionality. So, before customization, the code is in a certain manner specific to the actions performed on it. Features of a software framework include — Extensibility, Inversion of Control, Default behavior, Non-modifiable Framework Code. Software frameworks are also almost like skeletons, with complete sets of tools that would help you perform certain tasks. These are very important, because they let you concentrate on building the logic of your application, and not on the lower-level functionalities, which could be a waste of time. 2. Web Application Frameworks — Web applications frameworks, or web frameworks help you build web-enabled applications You can build simple blogs or complex AJAX rich applications with login forms, menus, dashboard, social sharing buttons, database, security, photo-video gallery and so on. Web frameworks were also created by developers to help new developers entering the foray. They save time, making the development process quicker and smoother. 1. Python: This is a highly flexible programming language that developers use to get a web app up and running, especially enterprise scale applications. It has a robust collection framework for building apps quickly without the hassle of handling details like sockets and protocols. Main languages include Django, Flask, Bottle and Pyramid. 2. PHP: PHP is a basic platform that lets you develop great applications by saving loads of time, preventing the use of repetitive coding and letting you develop quick applications. There are numerous languages within the platform that provides you with the basic structure for making great applications. Some of them include CodeIgniter, CakePHP, Laravel framework and Zend framework. 3. Ruby: Ruby is a dynamic, open-source programming language with an elegant syntax that lets you develop applications quickly. There are different Ruby frameworks like Ruby on Rails, Sinatra, Padrino, Hanami, Scorched, etc. Frameworks help you develop products that are completely aligned with business rules, and provide an application that the user would love. It can help you have maintainable and upgradable code, so you can save time on other core areas of the project. Hence, the basic principles of a framework are:(1) not to reinvent the wheel, (2) not to waste time on the foreboding,low value-added tasks and (3)put in complete emphasis on business rules. Security: A framework that’s used popularly has big security implications. Normally, as there is a huge community of developers, someone or the other will be coming up with security holes, and the fixing of these problems will also be done suitably. Security issues will be quickly identified and cleared. Efficiency: The entire process for app and software development becomes a piece of cake as you no longer have to write code for everything. There are pre-built functions that would save a lot of time and effort. What once took hours and hours and hundreds of lines of codes, is now a simple task. Support: As mentioned earlier, these frameworks have excellent community support. If you run into a glitch, it can be easily cleared. The documentation of these frameworks is also quite helpful, making it easier for even a beginner to find his way about. Cost: Several of the popular frameworks are free, since they are open-source, and since the developer finds it easier to finish his tasks, the entire project will be finished within the deadline, leading to a happy client and a happy stakeholder. Which is the Better Web Development Framework — Django or Laravel? Written in Python, Django is a very powerful and popular framework. It was released in 2005, and has had many stable releases since then. You don’t need to have an expert knowledge of frameworks to get started with Django, because it has a very easy learning curve, with easy to understand documentation, and a number of free tutorials and eBooks. The framework is open source, and a widely used one with updates regularly done by the developers. Laravel is known as the PHP framework for web artisans. It is a free, open source PHP framework created by Taylor Otwell, wherein applications are built in the MVC pattern. Model-View-Controller architectural pattern has everything in it to deploy amazing Laravel applications. As developers might say, the framework follows a “batteries included” philosophy, where they get whatever they want “out of the box”. The framework can help you build any kind of website, right from simple CMS to social networking sites, news sites, etc. Now, let’s go deeper into a comparison of the two on various parameters. Django: As explained earlier, Django is an open source framework loved by developers from around the world. It was initially developed by an online news operation to create trustworthy web applications using Python. The framework comes equipped with libraries, templates, and an API for connectivity and natural upgrades. Any missing plugins in Django can be easily added through the numerous app plugins. It follows the D.R.Y principle, or the Don’t Repeat Yourself, in terms of coding. Laravel: Laravel is also a free and open source web application framework for web artisans, with elegant syntax. The aim of Laravel is to make the entire web development process a very easy and quick one, enabling the developers to create the best code. It also ease the pain points by making the common tasks like authentication, routing, sessions, caching easier. Laravel is more suitable for developing large, powerful apps. The best features of the framework include expressive migration system, inversion of control container and tightly integrated unit testing support. Django — Django comes highly recommended by the programmers, and follows the MVT or the Model View Template approach, as opposed to Laravel. Checking the TIOBE programming community index would tell you that Python programming language is in the fourth position and it is the second most popular language on GitHub with 1M opened pull requests. Laravel — Laravel follows the OOP or Object-Oriented Programming approach and MVC or Model-View-Controller approach. According to the ranking in TIOBE Programming Community index PHP programming language is in the 7th Position and it is the 5th most popular language on GitHub with 559k opened pull requests. Django: Web programmers at the newspaper, Lawrence Journal-World, Adrian Holovaty and Simon Willison created Django in 2003, and released it publicly in 2005 under the BSD license. The programmers used Python to build applications. Laravel: Taylor Otwell created the PHP web framework, and it follows the MVC pattern. It has some conventions you can use in your project, complete with some external dependencies like Sentry for error tracking. Django: The learning curve for Python is virtually non-existent. So it is simple, and quite easy to use Django. Offering better readability for code, the framework instantly puts the beginner developer at ease. Laravel: Laravel is very intuitive and will let you master modern PHP development with database migrations, Eloquent ORM Composer, packages, REST, templating, etc. Learning resources are abundant, but you have to master it, considering the steep learning curve. Django: You deploy your app in a completely hostile environment, where malicious users, bots and hackers are waiting to eat into your security holes. Security in Django is a real serious affair, and helps developers avoid the common mistakes that usually plague them in web app development. Examples would be SQL injection, cross-site scripting, cross-site request forgery and clickjacking. Security is also provided while managing passwords and user accounts. Laravel: Securing web applications is normally done through salted hashed passwords. Laravel also has some mechanisms to protect their users in events like cross-site scripting (XSS) attacks, SQL injection vulnerability, intercepting private information, insecure cookies and so on.In spite of all this, security in Django is much superior to Laravel. Django: Plaintext test — 3127 requests/seconds, JSON test — 3060 requests/ seconds, Random SQLite Fetch test — 2137 requests/ seconds. Laravel: Plaintext test — 212 requests/seconds, JSON test — 167 requests/ seconds, Random SQLite Fetch test — 140 requests/ seconds. Django: Being a “batteries included” framework, Django has a really strong library. There are plenty of self-contained packages that provide reusable features. Laravel: The library is also good, and you can build any website with it. It is also extensive, with thorough documentation and a video tutorial library of over 1100 video tutorials. Django: Routing could be a little difficult in Django as it doesn’t have an in-built structure to create API. You will have to do it yourself, or use Django REST framework. Django comes with some built-in decorators, like login_required, require_POST or has_permission. There is an admin application that would help you to automatically build a site area and create, view and modify or delete records. This saves time during development. The framework provides base view classes suitable for a wide range of applications. It also has its own caching system to help you save your dynamic pages, and you can avoid calculating them whenever needed. It could be an output of a specific view, a part of a template or an entire site. The framework makes it much easier to provide programmatic mechanisms to declare, render and validate forms against a set of rules.There is middleware support for conditional GET operations. Django has extensible authentication system and dynamic administrative interface. Laravel: Routing is quite simple in Laravel and there is an easy way to create an API. Laravel boasts of an eloquent object-relational mapper, known as ORM. These deliver high-level abstraction on relational databases to help developers write Python code instead of SQL to create, read, modify and delete data and schemas in their database. The framework architecture’s bundles and composer provide number of bundle modular packaging system and dependencies. This allows for easy additions to applications, especially since the release of Laravel 3. The Laravel site can work several times faster and provides in-house support. Laravel supports a number of cache backends, including Redis and Memcached. It also provides support for SASL, options, and persistent connections. Django: Offers a large community of 1530+ contributors as on Feb 13, 2018. If you are ever stuck with a problem while developing applications, there will be someone to draw you out. 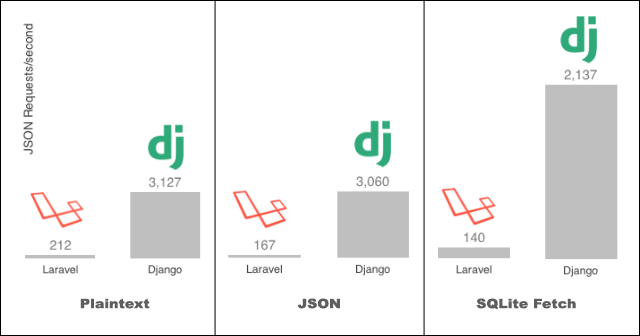 Laravel: The community is much smaller when compared to Django. There were about 435+ contributors as on Feb 13, 2018. However, new developers join in every day. As you can see, the popularity of Laravel surpassed Django over the last few years. Django: As the framework can easily scale itself and confer to high traffic demands, the following websites use it — Pinterest, Instagram, Sauce Labs, Udemy, Mozilla Firefox, NASA, Onion, Mahalo, The Washington Post, etc. Laravel: Tons of excellent projects are built with the framework. Here are some of them — 9GAG, UNION, Toyota Hall of fame, Camping World, Explore Georgia, CEENTA, Invite Watch, Packet, Utrip, etc. The debate between Django, written in Python and Laravel, written in PHP would most certainly be a debate between Python and PHP. Even though the ultimate choice would be dependent on what your requirement is, Django is a major help in removing the hassles of web development, as developers can just focus on writing the app without worrying about re-inventing the wheel. The aim of Django was to take the developers from project conception to the launch platform quickly, and it really helps in that. It also takes away your worry about security issues like cross-site request forgery, SQL injection, cross-site scripting, and clickjacking. Developers can manage user accounts and passwords through a reliable user authentication system. Laravel on the other hand, offers an easy approach to beginners, especially in routing. You can easily build huge enterprise grade applications or simple JSON APIs with this framework, and easily test it through unit testing. The problems that developers faced with earlier versions of Laravel have been revamped, and Laravel 5 comes up with amazing features that can make your app scalable, secure and highly responsive. If you ask developers you would directly be taken to two different camps — one for Django, and the other supporting Laravel. Go through the full features and advantages of both, and make your decision. However, Django does have a very established library, advice and tutorials section, wherein Laravel is newer and still growing. In my thoughts there is no comparison between these two frameworks, because both of them are superb.